Bring new life to an old sweater by embellishing it or create original works of art from scratch - all with needle felting! Felting Fibers | Felting Kits - the quick and easy solution! Needle felting is easy and quick with endless possibilities to create beautiful and unique flat and 3-D art forms. This form of dry felting just needs fiber and felting needles. 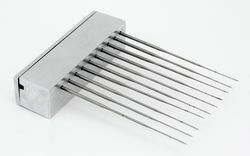 The five needles are made from high quality carbon steel 36 gauge, triangular with two barbs per side. The punch is made from Silver Beech hard wood and has a turned comfortable hollow handle. Wood contoured handle measures 5.5"
Needle felting is easy and quick with endless possibilities to create beautiful and unique flat and 3-D art forms. This form of dry felting just needs fiber and felting needles. 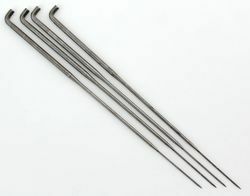 The three needles are made from high quality carbon steel 36 gauge, triangular with two barbs per side. Easy and safe storage. Measures 6.5" including needles. Smooth punching goes quickly on a brush-like mat. This mat is useful when doing needle felting appliqué. Ideal for large fancy work pieces like sweaters and scarves. Mat measure 6.5" X 4.5". Fine Gauge replacement needles for the clover Felting Needle tool. Five needles per package. Heavy Gauge replacement needles for the clover Felting Needle tool. 5 per package. Clover felting needle tool comes with 4 needles so you can use from 1 to 4 needles depending on the size of your project. Spring loaded protective sleeve to protect you from the sharp needles. Perfect for flat, sculptural or appliqués. 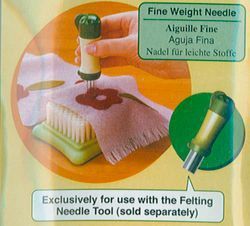 Pen style needle felting tool is great for small and delicate felt projects using 1, 2, or 3 needles. 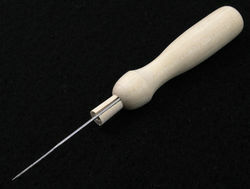 Easy to grip wooden handle for a single felting needle. Helps lessen hand fatigue. 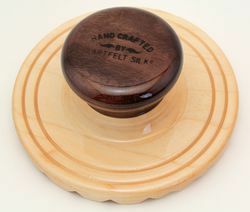 Can be used with any size felting needle. Needle rests in a grove along the shaft of a 1 1/4" tapered dowel which is then inserted into the handle until it meets with pressure. Needle replaced by simply pulling out dowel, switching out needles and reinserting into the handle. 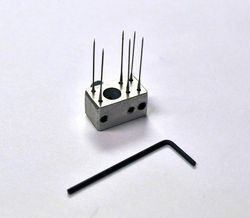 Allows needle length adjustment of 1/2". Give your felting needles, or pins, a proper resting place in the grassy meadows of a hand painted, hand felted needle holder. Handmade by Kick the Moon Farm ceramic container, just the right depth for felting needles, is decorated with a picturesque scene of sheep grazing in a green meadow blanketed by a blue sky with billowy white clouds. The felted center, for holding your needles, is made to resemble the grassy meadow. It is certain to be a favorite among all fiber lovers.Handmade, product look will vary, pieces are unique. Made in Maine. Package of 4 3-barb 38 gauge needles. Good general purpose needles for sculptural work. 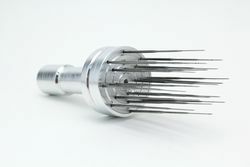 If you only want to buy one type of needle, this is the one to purchase! Package of 4 - 38 gauge star felting needles. Barbs are at the very tip and are shallow so are good for fine detail. Package of 4 - 36 gauge triangular felting needles. 2 barbs per edge. 3.5" long. Slightly more aggressive needle which will entangle more fiber with each poke than higher gauge needles. Convert your own sewing machine into a felting machine. Comes with adapter and piece of dense foam. The adapter comes with a 3 pages of instructions and a piece of dense foam. Some adapting is necessary to make your sewing machine into a felting machine. Please do not use your good sewing machine for this purpose. We have not found a machine that was not able to be converted. You can&apos;t use that machine for sewing again after it is converted. You have to remove the feed dogs, bobbin case etc and any metal parts that are under the needle then place a piece of the foam included in the space under the needle. Help prevent nasty needle sticks and broken needles by using this foam felting pad. This foam felting pad provides a working surface into which the needle can penetrate while you work. 9" x 8" x 2" thick. 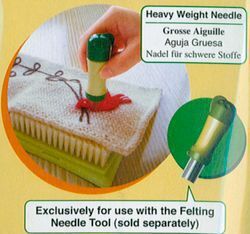 A fantastic, superior quality multi-needle felting tool. Engage up to 10 needles in a straight line. Easily penetrates the wool. Ideal for locking in fibers on medium to large designs and tapestries, as well as defining edges and boarders. 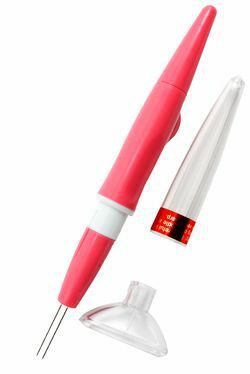 To change needles unscrew top plate with a philips head screw driver, replace or remove needles as desired and screw top back on. Comes with 10, 38 gauge triangular needles. Ease hand fatigue with this light weight, hand tooled aluminum needle felting holder. 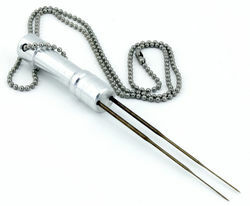 Holds 1 or 2 needles of any size. 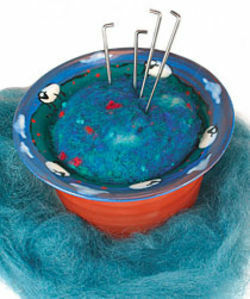 Use for needle felting a small or large area. Screws apart for easy needle changing. 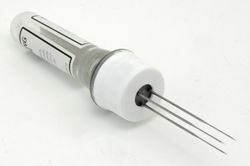 Includes 2, 38-gauge needles. 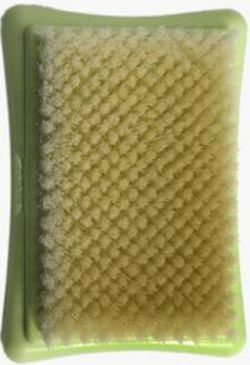 The Palm Washboard is a great way to felt your fibers together. Made from native hard woods and sealed with 3 coats of a two-part epoxy. It fits nicely in your hand with less fatigue and when used in a circular motion helps bond the fibers faster and stronger than traditional wet felting methods. Less stressful and labor intensive than traditional wet felting methods. You can combine elements of needle felting, nuno felting and wet felting. Individually handcrafted, designed and developed by Heartfelt Silks. Sizes are approximate and will vary. 5" Diameter x 1.75" Height. When only the best will do. Woolbuddy Felting Mat is 100% wool, a natural material. 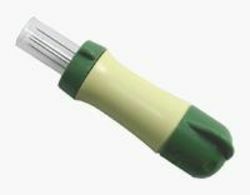 Firm yet able to be penetrated, the surface is ideal for rolling wool and needling. It won&apos;t break down like foam mats or leave little particles in your work. 6" by 6" by 1"
When only the best will do. 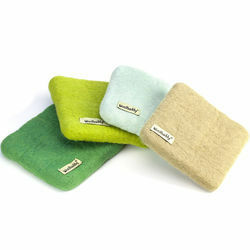 Woolbuddy Felting Mat is 100% wool, a natural material. Firm yet able to be penetrated, the surface is ideal for rolling wool and needling. It won&apos;t break down like foam mats or leave little particles in your work. 10" by 10" by 1"